Our portfolio of solar pv panels is constantly updated to bring you the newest products. Our solar panels have the best performance, quality, best price and best guarantee terms in the market. As a leading global solar panel retailer and solar distributor our purchasing power enables us to deliver the solar products at best prices. The product range covers power ranges between 50W up to 410W, suitable for all types and sizes of photovoltaic installation. 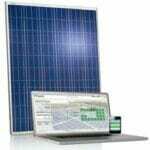 Solar panels can be ordered 24/7 from our online shop. ZEROhomebills.com and its partners stock solar panels in 4 warehouses around the globe. Share your experience, learn from others, follow-up on our training and webinars in our ZERO Home Bills Community. Browse solar panels from major brands like JA Solar, REC Solar, BenQ AUO, Astronergy, Sunpower, Canadian Solar, LG, Panasonic, GCL, Q-Cells and more. Panels ship straight from our distribution center in Cardiff, United Kingdom and Neu-Anspach, Germany. Everywhere you look, solar panels are gaining ground. In various regions of the globe thanks to naturally sunny weather, it’s no wonder why more and more people make the investment. In addition to the affordability factor and the big drop in component prices, there is also the matter of saving money energy-wise. But isn’t the whole installation process a complicated one? And what makes one panel more special than the other? Apart from providing every customer with the best possible solar panels the market has to offer, we also pride ourselves on keeping people informed. Here are some quick facts, considerations and features about solar, to get you started. Solar panels are made up of silicone cells, which is the magic component for turning sun-rays into energy. Some panels will have a single, solid silicone cell (monocrystalline), while others will have pieces of silicone that have been melted together (polycrystalline). These cells are then fixed inside a frame, and covered with a protective glass. WHAT TYPE OF SOLAR PANELS I CAN BUY? The panels are classified into three classes: mono-crystalline (single crystal), poly-crystalline (multiple crystals), or amorphous silicon. Area of Best Use: Residential and Commercial Solar Projects, especially if there is limited installation space. Making polycrystalline panels is cheaper and it’s a newer technology. The silicon cools unevenly and creates many different crystals giving it a less uniform appearance. Polycrystalline solar panels tend to be the most affordable, but they also put out a little less power. Even so, poly panels are gaining in efficiency and will usually have the lowest price per watt. 60-cell solar panels tend to be the most common for residential and commercial systems. Most 60-cell panels measure around 66×40”, with power output ranging from 270-390+ watts. 72-cell panels are commonly used for larger systems, especially utility-scale but also residential and commercial projects. Most 72-cell panels measure 77×40” with power output in the range of 325-400 watts. 72-cell panels are ideal for larger systems because the bigger size reduces the total number of connections and components, making for an easier installation with less maintenance. All our solar panels come for world leading manufacturers. We are the resellers and/or distributors of a wide a range of polycrystalline and monocrystalline solar panels as well as smart panels. If needed our smart panels come with embedded SolarEdge and Tigo solar optimizers. Axitec is a German Brand with manufacturing facilities in Germany and Asia. The solar products are available from both our European and USA warehouses. The company has a long tradition in manufacturing high efficiency solar PV panels. BenQ AUO was one of the first companies manufacturing 21% + efficiency solar modules. Available just in our warehouse from Europe. The Solar panels are manufactured at the highest standards. The PV modules are available from both our European and USA warehouses. GCL is the 6th largest solar module manufacturer in the world. Beside manufacturing GCL also possesses several large-scale solar farms globally and abundant experience in the operation and management of solar farms. The panels are available from our warehouse in Europe. Luxor Solar is a German solar panel manufacturer. The panels fully comply with both EU and USA regulations and are available from our warehouse from Germany. The Q-cells solar panels are manufactured in South Korea and are one of the nest value for money solar products in the market; featuring high performance and half cell modules. The panels are available from our warehouse in Europe. The Chinese Perlight has more than 3 decades of experience in solar panel manufacturing. Their portfolio features black mono, poly and glass solar panels. The Perlight solar panels are available from our warehouse in Europe. JA Solar is a Tier 1 solar panel manufacturer from China. The poly, mono and SolarEdge optimized smart panels are within the top 5 best selling solar panels in the world. JA modules are available from our stock from Europe. The German manufacturer from Memmingen, Germany is one of the pioneers in off-grid solar solution globally. Phaesun 0ff-grid solar modules are available from our warehouse in Europe. The company was ranked the number 1 solar panel manufacturer in 2017. The Chinese manufacturer` products are amongst the highest quality solar panels available. Jinko Solar panels are available from our European warehouse. The Norwegian REC Group is manufacturing solar panels suitable for harsh environment, especially where shading is an issue. REC solar panels are available from our European warehouse. The South Korean LG Solar is amongst the top 3 best quality solar panels in the world. With a 25 years product guarantee the company sets the standards for monocrystalline panels. LG Solar panels are available from our European warehouse. The Canadian Silfab is the leader in the North American solar panel manufacturing. Silfab solar panels are available both in 60 and 72 cell modules. We stock Silfab modules only in our warehouse in the USA. Thanks to our special relationship with Panasonic Europe we are able to offer the Panasonic solar panels at a very attractive price. Panasonic solar panels come with a standard 25 year product guarantee and are available from our warehouse in Europe. The solar panels are integrated part of our Sundaya off-grid lighting product portfolio. Sundaya kits and panels are available from our warehouse in Europe. With almost 2 decades of experience the Chinese Suntech Power is one of the leading manufacturers in the world. The solar panels are part of our value for money packages. Suntech Power panels are available from our stock in Europe. The German SunWare is one of the leading manufacturers of marine solar panels. At SunWare testing is carried out under the harsh environmental conditions which are later expected for the product. SunWare panels are available via our European warehouse. As an official distributor of Trienergia solar panels we are able to offer the Italian solar panels at a very attractive price. Trinergia is amongst the few manufacturers that produce triangular solar panels. The panels are available from our European stock. The Chinese Trina Solar is within the top 5 global solar panel manufacturers. Characterised by quality and reliability the Trina Solar panels are available for delivery from both our European and USA warehouses. The Dutch Victron Energy, a leader in the on- and off-grid solar power production components has in its portfolio high quality solar panels mainly used in off-grid applications. An excellent choice for your off-grid project. The solar panels are available via our European warehouse. The American company has three decades of solar leadership manufactures mono and poly high performance solar pv panels for residential, commercial and solar power plant use. SunPower is the solar energy choice of more homeowners and businesses around the world. Itek Energy manufacturing facility of solar PV panels is located less than 90 minutes north of Seattle in Bellingham, Washington. Itek manufactures both poly and monocrystalline, as well as TIGO optimized Smart solar PV panels. ZEROhomebills.com solar manufacturers provide up 30 year power guarantee on the solar panels. We offer the longest power guarantee on the solar panel in the industry to assured our solar panels generation of energy, and also to assured you get the right return based on your investment. ZEROhomebills.com solar panels 30 years power guarantee provide a reliability which is beyond compare. Solar panels are used extensively in rural areas, where access to the grid is non-existent or inaccessible. These installations are called off grid (or independent, stand-alone, island) solar power systems, and require the use of batteries to store the energy for use at night or on long stretches of overcast weather. The energy stored in the batteries leaves the batteries as DC electricity which can power DC appliances (as in RV’s) or be converted to alternating current (AC) for use with conventional appliances. Much like running your own mini utility company, this method gives you full independence from the national grid. You can eliminate the cost of batteries by going with a system that connects right into your home’s main junction box and use the grid as your power source at night or on long stretches of inclement weather. These installations are known as grid-tied or grid-interconnected solar systems. This version of solar system enables you to sell any excess power you produce back to the utility companies who have chosen to support “net metering”. Once you are signed up on a net metering program, your utility company will have a smart meter installed known as a Time of Use Meter, which will actually run backwards when you are producing excess power. It is wise to keep in mind that Grid tied systems without a battery backup, are only functional when the grid is operational. Due to anti-islanding features on grid tied inverters, which protect utility workers from working on a live line, grid-tied systems without a battery back up will not continue to produce power during a power outage regardless of whether you have sunshine or not. What other components and equipment I need for a fully functional solar system? The inverter has one specific purpose – to safely switch the DC energy from the solar panels to AC energy, which can be used inside the home. Without a solar inverter, you won’t be able to utilize the energy for your appliances or lights. Since the solar inverter is the heart of every solar system it’s logical that you want to invest in a quality inverter; given its critical place in the equation. You can find out more about solar inverters here. Batteries are an optional components. There are people who use solar power on demand, which means they only use solar energy when the sun is shining. But it also means they don’t have solar power during the night. For the most part, when people install a solar array, they take the battery option as well. Provided that you probably spend most of your day at work and use most energy at night, batteries just makes sense. Naturally, you get different sizes, models, and quality options from world leading manufacturers. Just like the batteries, a solar charge controller is an optional component. It regulates the current used to charge the battery which comes from the inverter. However, a solar charger does become a necessity if you are using panels with high outputs. If you want to maintain the health of your battery and the overall efficiency of the solar array. Customize your solar panel system and gain a lot more control on your solar system. From monitoring, wiring, strut and other mounting components you can find everything you need to be able to fully commission your system. We have them all. Now, the silicone cell is the magical component that turns the UV rays into DC energy. Once the rays have been harvested and transformed into practical energy, in a manner of speaking, it gets sent to an inverter. The inverter takes the flow of energy through another transformation, switching it from DC energy to AC. The latter is the energy/electricity that gets used inside your home. And just to clarify, the inverter and the solar panel are two separate pieces of solar power equipment. Even though solar panels were expensive several years ago, in the past years the price drop has been dramatic. Now, it just makes more economical sense to invest in solar panels, because they give you some or full independence from the grid (depending on the size you install), save you money in the long run, and they are environmentally friendly. In terms of actual pricing, everything depends on your needs and your budget. You can start by adding a solar geyser and test the efficiency for yourself. And from there you can install more. The good news is that ZEROhomebills.com offers the most affordable panel from the best manufacturers with the highest efficiency levels, right to your doorstep. Only choose between our quality range of panels, which are just as durable as they are impressive. Solar panels aren’t all made equal, which makes the brand of solar panel you choose very important. Essentially, the best way to know if brand is worth your attention or money is by getting to know them a little better. At ZEROhomebills.com by Solaranna, we only stock high-quality brands that prioritizes affordability. In other words, we want to make the best brands available to you at the best prices. If you have any questions, feel free to contact us at any time. We’ll try to help you both in the selection of the right solar panel and/or solar component as well as during the installation process. Alternatively, you can visit our Blog and News section to learn more about the products and industry trends. Solar panels in the UK are an increasingly popular renewable energy technology. Based on national statistics by the Department for Business, Energy & Industrial Strategy, in 2017 the UK generated 3.40% of its total electricity using solar power. Source: Wikipedia. “ENERGY TRENDS – Table 6.1. Renewable electricity capacity and generation”(PDF). Department of Energy & Climate Change. March 2018. p. 71. Besides being environmentally friendly, solar cells provide significant savings on your electricity bill. And whilst there are a few disadvantages, the long-term benefits of investing in solar panels far outweigh the cons. If you are looking for a solar energy solution for heating, solar thermal is an affordable solution. Another option is installing thermodynamic panels (we are not selling them!) which are more expensive but can supply 90% or more of the domestic hot water needs. Energy bills have in the past years increased by at least 7% per annum. You can protect yourself from the rising utility bills by incorporating solar panels into your energy mix. This will reduce your electricity bills significantly. So whilst utility costs continue to peak each year, having solar panels can help to reduce the impact. Also, keep in mind that the electricity generated from the solar panels is free. Through Feed-in Tariffs (FiT) you can get paybacks for the electricity you produce. The Feed-In Tariff is an initiative by the UK Government aimed at helping you to become more self-sufficient and sustainable in your use of energy, whilst earning some extra income. The added value of the FiT is that payments are tax-free, index-linked, and have a 20-year guarantee. If your system produces more energy than you need, through the generous tariff schemes, you can sell the surplus back to the grid. Thus, apart from cutting down utility bills, your investment in solar panels gives you a warranty for a state-backed income for the next 20 years. Switching to solar energy cuts your carbon footprint, as it is a green, renewable source of energy. Unlike traditional electricity generators, solar power does not release any harmful carbon dioxide (CO2) or other pollutants. Estimates also show that solar panels for homes could save around one tonne of CO2 per year, which comes to approximately 25 tonnes over its lifetime. Solar panels need almost no maintenance. Once the panels are installed, you need to keep them clean and check whether any trees begin to overshadow the solar PV array. Keeping the installation clean can be even easier when solar panels are installed on the roof are tilted, since rainfall can help clean dust off of the system. With ground solar panels, maintenance may be more problematic, as the installation can accumulate dust, debris, snow, or bird droppings. Any dirt can be removed from the solar panels with the use of hot water, a brush, and possibly some washing-up liquid. Solar panels are ideal in remote areas where extending power lines to connect with electrical power grid would be too expensive. They are an affordable and effective solution for isolated homes in the rural areas of the country. There is also the possibility of integrating batteries in solar cell systems, and this can be used as an energy storage. Batteries store energy gathered by solar cells, saving it for rainy days or for use throughout the night. Solar battery storage system costs are not low, ranging typically between £1,200 and £6,000 depending on the size and capacity. However, technological developments are leading to new solutions and will eventually come up with a great solution for solar energy at night. It comes as no surprise that solar panel costs are initially high. Although, a number of subsidy programs, as well as government rebates, help to counterbalance the expense. As new technologies in the solar panel field emerge, prices for solar panels are expected to continue to decrease making the investment more affordable. Solar panels are dependent on sunlight, and while this does not necessarily mean direct sunlight, they are most efficient in locations with bright and direct the sunlight. Thus, they cannot produce energy during the night and are less effective during dark winters. The effective solution for this is, therefore, to switch to the main power grid at night. Alternatively, homes with a standalone system can store energy in batteries during the day to be used at night. An inaccurate placement of solar modules can be a major hindrance on the effectiveness of electricity generation. The ones who are most affected by this are homes that are covered by trees and landscapes. In the same way, if you live in an area surrounded by large buildings, the effectiveness of the panels will be limited. However, the effectiveness can be increased by adding more panels to your rooftop to generate a sufficient supply of electricity. It is difficult to calculate the exact cost of solar panels due to the many factors that can affect the price of solar panels. The average domestic solar array for electricity may cost between £2,500 to £9,000. Generally, the more expensive the system, the more electricity it generates and therefore the more savings it can bring. In contrast, installing a typical solar heating system is much cheaper. Prices can vary from £1,500 to £5,000 depending on the size of the installation and its features. It is important to note that despite solar panel costs being known to be expensive, in recent years the prices for solar panels have dropped considerably, and improvements in technology have led to more efficient systems, making the advantages even more tempting. In England, Scotland and Wales you are not required to apply for planning permission for most of the domestic solar panel installations (both heating and electricity). It is important to note, however, that the installation must be below a certain size. If your solar panels protrude more than 200 mm, you will need to apply for permission first. There are also other local restrictions that might affect whether you need permission or not; especially in Scotland. For example, when the building is within a conservation area of World Heritage Site. Therefore, it is advised to ask your solar installer to check, whether your installation meets all the requirements. In most cases, when you install panels on your roof, your insurance should cover you under the current terms. However, since the solar panel installation means a change to the home structure, it is advised to always contact your current insurance provider before taking on the installation. It is important to note that your home insurance may not include a cover for damage or theft to your solar panels. To avoid any uncertainties, it is advisable that you consult your insurance policy to confirm that your panels are covered. Installing solar panels are a worthwhile investment for both homes and companies. They ensure greater sustainability, reduce utility bills and in the long run help you to put money back into your pocket. How Can I Find the Right Solar Supplier and Solar Installer in the UK? We are one of the players you are looking for. With all that said, finding the right solar supplier and installer is not as easy as it may seem. Undoubtedly, since the required investment is quite significant, you will want to make a sound purchase which you will be pleased with throughout the entire lifespan of the solar system. Therefore, you should compare solar suppliers and their respective options, and make sure that you pick a reliable and certified supplier. We know that finding the right solar panels suppliers might mean investing time doing research. We want to make this process simpler by providing you free, non-binding quotes based on your requirement; regardless of your geographic location. How? Simply fill in the contact form, stating your needs and preferences. We will get back to you as soon as possible to ask you some further questions and connect you with the most suitable installer in your area so that you get the best service! Are you ready to go solar? Eliminate the guesswork with complete systems assembled by our professional solar installers. Our solar packages have everything you need to start generating and using your own power: solar panels, inverters, racking-mounting, and all the accessories to get your system up and running in 48 hours. After the scaffolding is set, the installation team arrives. The team starts out by attaching the roof anchors, which will hold the base for the solar panels. The types of anchors used depends on the type of roof tile fitted on the roof. The next step is to attach the frame, which is made up of aluminium bars. The bars must be fitted in a straight direction and parallel to one another. Once the frame has been attached, the installation of the solar panels themselves can begin. The panels are clamped to the aluminium frame, but initially not too tight so as to permit adjusting on the frame. Once they are set up at the desired position, these will be firmly anchored. Now that the panels are fastened securely on the frame, the next step is to wire them. In most of the cases the panels come wired from the manufacturer, however, these need to be connected to the inverter, which would typically be in the attic of the household. The inverter is a component of the panel system which converts absorbed energy from the panels into DC electricity, which can be used by the household appliances. Be prepared to replace your solar PV inverter every 5-10 years, as these machines tend to have shorter lifespans than solar panels. After the panels are wired to the solar inverter, the final connections to the consumer unit will be made. A generation meter will also be connected, whose purpose is to monitor how much electricity the solar panels actually produce. During the time of the wiring installation, the electricity supply to the household will need to be shut off. After the wiring is set up to the inverter, together with the generation meter, the installation is nearly finished. Now the only thing left is to switch the power on and test the system. Once this is complete, the installation is officially over and the system can start working.